List of materials found in a typical high school or college chemistry stockroom and laboratory that based on respective MSDS sheets, should be stored in a fire cabinet, hazardous materials cabinet, or corrosive materials storage cabinet. Storage and Safety in High School Chemistry Classrooms and Laboratories is of utmost importance to the students, staff and parents. One of the more tedious things for a secondary science educator is to properly maintain and take inventory of their chemical stockroom. This needs to be done every couple of years for effective safety measures. It is a well-known fact that certain chemicals should be stored in certain areas, and many of these hazardous chemicals may need to be stored separately within said safe storage vessel. After taking inventory in my stockroom with the help of some of my upper level students, I compiled what my total inventory consisted of, along with the conditions each chemical was in, shelf life of each chemical, and where it is safely stored. In this post, you will find a glossary of the types of chemical and compounds that need to be stored in an OSHA compliant storage cabinet. This post will be broken down into two main categories of chemical based on their proper storage area. A brief description of each chemical, along with its inherent hazards based on MSDS sheet will also be provided. If a chemical has flammability ratings of 1-4, it must be stored in an OSHA compliant fire safety container. The following is what my classroom currently stores in terms of flammable materials. All of these materials are stored in a Flammables Cabinet. Acetone: Dimethyl ketone, or more commonly referred as Acetone, is an extremely flammable Solvent used in numerous chemical applications. It is a great solvent in the lab (which translates to great for cleanup after lab exercises) and is used in gas chromatography as well. It is an extremely flammable category 2 liquid. Also causes eye and respiratory problems if directly exposed. Amyl Alcohol: Also commonly referred to as Pentyl Alcohol, is a class two flammable organic alcohol. It is commonly used as a solvent to dissolve resins and some oily compounds. It is also commonly used to manufacture a number of other chemicals both on a small scale and large commercial type lab operations. It is a volatile compound that can cause issues in the respiratory tract if inhaled directly. Must be used in a ventilation hood or ventilated area. Carnoy’s Solution: Carnoy’s solution is a mixture of multiple volatile compounds that is used in numerous biological laboratory tests. Its uses range from the treatment of specific types of tumors, to the fixation of cell samples in the lab. The primary ingredients in this mixture are Ethyl Alcohol and Chloroform, both of which are extremely flammable and should be stored in the proper cabinet. Ethyl Alcohol: This alcohol is also the alcohol commonly found in alcoholic beverages. It is used as a common laboratory solvent that can be used for numerous applications, and also an additive in gasoline referred to as gasohol. It is a category two flammable liquid, possessing chemical properties that produce a highly flammable liquid and vapor. It also is harmful if swallowed, and can cause eye damage and irritation. Due to the possibility of this being a possible form of substance abuse for the students, and the high flammability of the compound itself, it must be stored in a locked flammables cabinet. Ethylene Glycol: Although Ethylene glycol is not inherently a high risk flammable compound, it is still considered a class one flammable compound, which still needs to be stored in the proper cabinet. Ethylene Glycol is also extremely poisonous, even at very small doses. It is common uses in the lab include the precipitation of proteins from solution, fractionation, purification, and crystallization. Isopropyl alcohol: a very common compound found in many medicine cabinets, first aid kits, and cleaning supply cabinets. It most commonly used as an antiseptic in minor cuts and scrapes, or as a cleaning solution for white boards and electronics. Isopropyl alcohol also has numerous uses in the biology and chemistry classrooms. In biology it is used to extract DNA from solutions of cellular material, which separates the DNA from the rest of the solution. It can also be used to preserve and or subdue live specimens for examination, mainly in the dissection lab. It is also commonly used in the chemistry setting to react with various substances. Considered a category two flammable liquid, isopropyl alcohol is a liquid that is commonly stored incorrectly. It is so common, that it is often stored on the shelf in the stockroom, but it is highly flammable and needs to be relocated to its proper storage container. Methanol: Methanol is another alcohol that needs to be stored in a flame retardant cabinet. A toxic compound, which can cause blindness when ingested in small amounts; or can cause death if larger quantities enter the body. It is used in the synthesis of many organic compounds in the lab. It is also a common laboratory solvent, and is also used in High Performance Liquid Chromatography. Methanol is a Category three volatile substance that must be stored within an OSHA approved flame retardant cabinet. Mineral Oil: also commonly referred to as “baby oil” or Paraffin oil is commonly found in the chemistry stockroom to store highly reactive metals such as Calcium, Potassium, Cesium, and Sodium. It is used to prevent water vapor in the air from contacting these highly unstable pure metal samples. It is also considered a flammable compound that should be stored in the proper storage cabinet. Petroleum Ether: A category two flammable liquid and carcinogen, Petroleum ether is a compound that must be stored properly, and handled with extreme care. Over time, exposure to this compound can cause mutagenicity in human cells, resulting in various types of cancer. A natural byproduct in the making of gasoline also referred to as “benzene”; this chemical is commonly used as a solvent for many organic chemistry applications. It can also be used as a glue or adhesive remover. Tolulene: This compound is extremely dangerous for multiple reasons, the most immediate threat is it is a class two flammable liquid. Toluene is a common solvent that is able to dissolve paint, paint thinners, silicone, and rubber. It is also used to make numerous products in the lab; the most famous of these is Tri-Nitro-Toluene or more commonly referred to as TNT. It should never be stored with any acids, especially any of the nitrogen containing acids. It also has applications in making plastic polymers. Toluene also has been shown to cause reproductive failure and cell degeneration in the reproductive organs of lab animals. Safe handling and storage is a must for this chemical. Xylenes: found in the group of aromatic hydrocarbons, this compound is one of the more flammable compounds found in the chemistry lab. It is a class three flammable liquid and vapor, which also is internally and externally toxic to human beings as well. Mainly used in histology for the fixation of cellular samples, it does have some chemistry applications as a solvent as well. 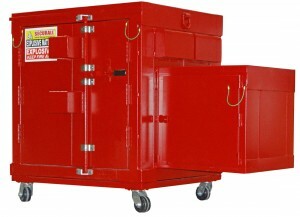 Storage of other hazardous materials such as acids (Class “E’ materials or Corrosives) is very similar to storing flammables in a special cabinet. My stockroom has a corrosives cabinet that is used to store all of my concentrated lab reagents. There are however, specific rules for storing acids in your stockroom that must be followed in order to ensure the safety of the students and faculty. Although the inert risk of flammability of pure acids and bases are not an issue, their seamless ability to react with other compounds stored near them is a danger in itself. Sometimes this requires certain lab reagents to be stored within a container or compartment separate from the rest of the acids within the cabinet. Special consideration needs to be made when determining what chemicals are going to be stored together. An acid is a substance that donates hydrogen ions. Because of this, when an acid is dissolved in water, the balance between hydrogen ions and hydroxide ions is shifted. Now there are more hydrogen ions than hydroxide ions in the solution. This kind of solution is acidic. A base is a substance that accepts hydrogen ions. When a base is dissolved in water, the balance between hydrogen ions and hydroxide ions shifts the opposite way. Because the base “soaks up” hydrogen ions, the result is a solution with more hydroxide ions than hydrogen ions. This kind of solution is alkaline. Corrosive materials also have a myriad of side effect upon exposure, either directly, or from the toxic vapors they emit. Concentrated acids should always be diluted in a chemical hood and always handled with proper eye, body, feet, and hand protection. These concentrated chemicals are extremely dangerous. Many people think that because something is on the basic side of the pH scale (pH of 7 through 14) that it is not as dangerous as a corrosive that is on the lower end of the pH spectrum. This is not the case; bases tend to cause more damage to tissues because they penetrate deeper into the skin, causing much more damage to the lower layers of skin on the body. Below you will find a list of acids that are currently stored within my OSHA compliant Corrosives storage cabinet in my stockroom. Ammonium Hydroxide: One of the least dangerous acids in my cabinet (although still very dangerous!). Very dilute ammonia solutions are sold over the counter as a house hold cleaning agent, but lab grade concentrated ammonia is very dangerous. Due to its high pH level, ammonium hydroxide solutions are alkaline. As a result, it is a severe eye, skin, and respiratory tract irritant that readily burns tissues it comes in direct contact with. Most commonly used in the chemistry lab to neutralize strong acids for proper disposal. Hydrochloric Acid: hydrochloric acid is one of the most used lab reagents in the lab. This acid has a very wide use in high school chemistry. For me personally we use it for titrations involving acid base neutralizations. It is also commonly used in dilute forms for geological identifications of different types of rocks, or to show chemical weathering to simulate acid rain with different rock samples. Considered extremely corrosive in higher concentrations, it must be stored in a corrosives cabinet. It also must be diluted within a chemical hood because the fumes when adding the acid to water can severely damage the respiratory tract. Full protective equipment is an absolute must when handling this acid. Nitric Acid: Most commonly used in the production of farm grade fertilizers, rocket propulsion, metal finishing, and explosives; Nitric acid is commonly found in high school chemistry labs as well commonly used for lab demonstrations and dehydration reactions. Extremely corrosive and fatal if swallowed, nitric acid is another extremely dangerous acid to handle and store. In addition to being stored within a corrosives cabinet, Nitric acid must be stored separately within the cabinet itself (My OSHA corrosives cabinet has a separate compartment to store nitric acid within). It is not to be stored with other acids, mainly ammonium hydroxide because of the inherent risk of explosive compounds being inadvertently formed during long term storage. Sulfuric Acid: one of the most important industrial chemicals in the United States, more of this acid is made than all of the others combined annually. It is used to make many of the other acids mentioned earlier, along with the manufacture of fertilizers and manufactured goods. It is also the main component of traditional batteries, especially automotive batteries. For high school chemistry, it is used to react with many metals as lab demos, or to produce hydrogen gas for demonstration as well. Once again, another highly corrosive substance that needs to be stored in a corrosives cabinet. It also needs to be handled with extreme caution while also wearing all of the necessary protective clothing. After reading this article, it is very apparent that student safety is the most important thing to consider when storing and handling these types of chemicals in the lab. Proper storage and safety drastically reduces the risks of injury or damage to the building. It is imperative that the instructor practices and teaches students the importance of how to handle these chemicals safely. This is just a very small list of all of the different types of hazardous compounds that may be found in a common chemistry lab. There are numerous others that are not mentioned in this article, so it is always important to keep MSDS sheets handy when an instructor or student is unsure of the risks involved with many of these chemicals. It is also extremely important that the building administrator be aware of where the MSDS sheets are located in the event of an emergency so that proper care can be taken during the situation. Stay safe and good luck! Compliance for HazMat storage requires the meeting of several OSHA specs. For complete solutions call 1-866-867-0306 to ensure your needs are met! Hazardous chemical storage is an incredibly heavily regulated industry,incorporating the laws and regulations of many government agencies and corporate entities. In order for a building to be legally labelled as “Hazmat Certified,” there are many criteria that must be met. 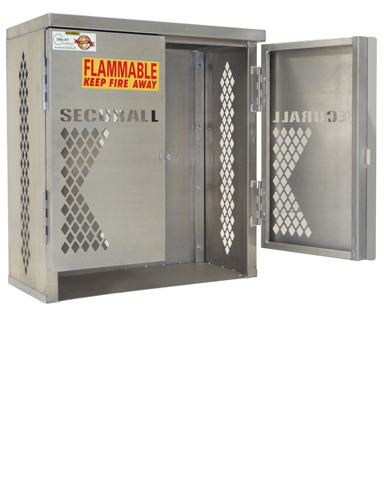 Securall Hazmat Buildings are designed for outdoor storage with 55 gallon drum encasement containing flammable or combustible liquids. The outer wall of the unit is manufactured with welded 16 or 12 gauge steel. Inner walls are constructed of 20 gauge steel. The buildings come standard with a commercial grade lockset handle, and 3” airspace through the unit. All models are National Fire Protection Agency (NFPA) Code 30 compliant. NFPA Code 30 is the national standard for the regulation of flammable, and combustible liquids. 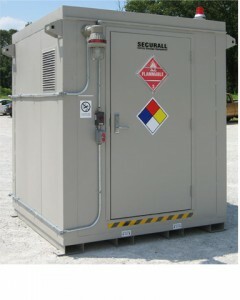 Units are also in compliance with Occupational Safety and Health Administration (OSHA) regulations with special consideration to part 1910, “Regulations for Hazardous Material Building Storage.” As well as being NFPA and OSHA compliant, Securall Hazmat Buildings also comply with all Environmental Protection Agency (EPA) protocol. durability and reliability of the building itself. The FM testing of the wall and roof is performed by Intertek Testing Laboratories. In addition to being compliant with the previous codes and regulations, Securall also meets Intermediate Bulk Container (IBC) requirements for closed shipping vessels with a liquid capacity from 450 L to 3,000 L (119-793 gallons). Securall Buildings also meet UL Fire Resistance Ratings classification criteria. 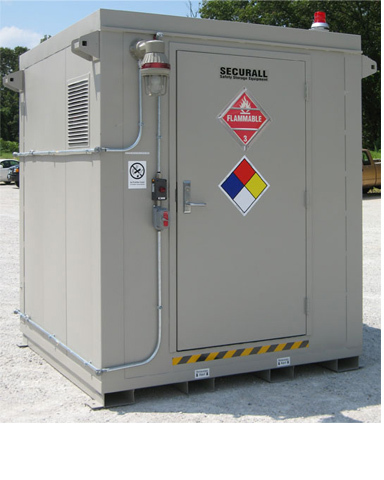 The Securall Hazmat Chemical Storage Building is available in sizes to fit 2-55 gallon, 4-55 gallon, 6-55 gallon, 9-55 gallon, and 12-55 gallon barrels, and the standard color is gray. Compliance with OSHA regulations and outdoor storage is essential. Get advice and prices on products to meet your requirements. The Agribusiness industry is faced with its own set of strict regulations and guidelines with it comes to the storage and containment of chemicals that are unique to its needs. Securall offers a line of safety storage buildings especially designed for use in the agriculture industry. These buildings are specially designed to comply with safety regulations when using pesticides, herbicides, and other turf chemicals. Golf courses and nurseries are also prime candidates for these particular types of containment units. Securall Fire Rated Storage Buildings carry the Factory Mutual System Approval label, and are FM Approved with regard to wall and roof design. Factory Mutual offers worldwide industrial and commercial product certification and testing services. Testing for FM was completed at Intertek Testing Laboratories. These buildings are also UL Fire Resistance Rated. 1.5 or 3 hour fire ratings. Chemical storage lockers and buildings are available in 68.4 cubic feet, 145.1 cf., 211.4 cf., 308.1 cf., 404.7 cf., 524.1 cf., 747.7 cf., 971.3 cf., 1,277.3 cf., 1,418.5 cf., 1865.7 cf., and 2,313 cf. When it comes to safety and compliance with NFPA and OSHA, it’s best to take the proper steps to ensure the highest degree of safety in your facility to protect employees and buildings. The storage of LP-Gas is covered by the Liquefied Gas Code (NFPA 58-2008). The NFPA 58 is “the industry benchmark for safe LP-Gas storage, handling, transportation, and use, NFPA 58 mitigates risks and ensures safe installations, to prevent failures, leaks, and tampering that could lead to fires and explosions” (NFPA). It’s important to educate yourself on the differences between flammable liquids and flammable liquefied gases, so to avoid the risk of storing them improperly. Due to their rapid release of gas, propane cannot be stored in containers meant for flammable liquids. Storage units for flammable liquids are designed to protect flammable liquid containers from fire for 10 minutes for safe evacuation. Thus, there are different regulations for protecting you and your employees from these gasses. Secruall’s Aluminum Gas Cylinder Cabinets* (Models #LP4S, #LP12S, etc), with .125” thick aluminum construction, are designed for outside storage and are resistant to weathering and discoloring. While their outdoor performance is better than painted steel models, their weight (⅓ of painted steel models) also make for cheaper shipping charges. They also follow OSHA SubPart 1910.110 requirements and NFPA 58-113 standards. Vertical models are also available for no additional cost (Models #LP8S-VERTICAL, #LPOGS, etc). Simply add “VERTICAL” to your PO. No matter which NFPA code you need to meet for compliance in your jurisdiction, you can be confident that the storage cabinet experts at K.L. Security can help you find the best cabinets at the best prices to meet your exact safety compliant needs. For more information please visit http://www.nfpa.org/codes-and-standards/document-information-pages?mode=code&code=58. *These cabinets are also available in painted steel models. Following OSHA and NFPA regulations for storing hazardous liquids outdoors ensures the safety of employees, your community, and the environment. Further, when done properly, it keeps your company safe from any violation of the law. Securall will help in meeting these standards. The following are important considerations to make when choosing your outdoor safety storage. Lockers are used to store chemicals not exceeding the control area, while buildings are used to store chemicals exceeding the control area. Classify your chemicals according to hazard. 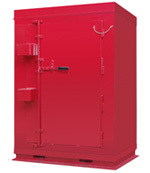 OSHA Approved Outdoor storage buildings & units can be designed to separate incompatible materials. Securall Outdoor Storage units should be placed outside on level ground or a concrete slab. There are various building codes to meet, including: UBC, SBC, UFC, NEC, AND CAC. There are various industry construction standards to meet: NFPA, BOCA, AWS, AISC, ANSI, ASTM, ICC, AND USPC. The are federal regulations to meet, including EPA and OSHA. The floor area should not exceed 1500 square feet. Outdoor Storage Lockers and Buildings safely store hazardous materials, flammables, pesticides, herbicides, and other agri-chemicals. To prevent leaking and contamination, Securall safety products are equipped with a sump area. The capacity of the sump ultimately determines the storage capacity. OSHA requires sump capacity to contain 25% of the total holding capacity or 100% of the largest container (whatever is greater). Securall has standards sizes or custom-design options to meet these requirements. Securall Outdoor storage is approved for the storage of flammable and combustible liquids (except the storage of Class 1A and the dispensing of Class 1A and 1B Flammable Liquids). Explosion Relief, which is found in Securall Haz-mat storage units, is required for storing and dispensing Class 1A and 1B Flammable Liquids. 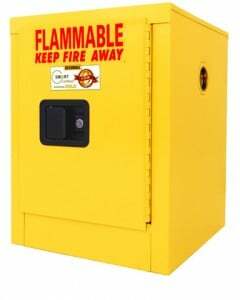 Are you struggling with how to properly store flammable liquids or combustibles in an OSHA approved storage cabinet? We help clients choose the best cabinets at the best prices to meet OSHA compliance, Call Toll Free 1-866-867-0306 today. A flammable liquid is any liquid with a flash point below 100℉ (37.8℃) or higher, making up 99 percent of the total volume of the mixture. These liquids fall under Class I. Class IA flammables are liquids with a flash point below 73℉ (22.8℃) ; boiling point below 100℉ (37.8℃). Examples include: acetaldehyde, butyne, chloropropylene, dimethyl sulfide, ethyl chloride, ethyl ether. Class IB flammables are liquids with a flash point below 73℉ (22.8℃) ; boiling point at or above 100℉ (37.8℃). Examples include: acetone, benzene, carbon disulfide, ethyl alcohol, ethyl acetate, gasoline, hexane, isopropanol, methanol, toluene. Class IC flammables are liquids with a flash point at or above 73℉ (22.8℃), but less than 100℉ (37.8℃). Examples include: amyl alcohol, butyl alcohol, isobutyl alcohol, methyl isobutyl ketone, styrene, turpentine, xylene. A combustible liquid is any liquid with a flash point at or above 100ºF (37.8ºC). Combustible liquids are broken into two classes: Class II and Class III. Class II combustibles are liquids with a flash point at or above 100℉ (37.8℃), but less than 140℉ (60℃). This does not include any mixture having components with flash points of 200ºF (93.3ºC) or more with a volume making up 99 percent or more of the total volume of the mixture. Examples include: No. 1, 2 and 3 fuel oils, kerosene, and hexyl alcohol. Class III liquids is any liquid with flash points at or above 140ºF (60ºC) and are broken into two subclasses. Class IIIA combustibles are liquids with a flash point at or above 140℉ (60℃), but less than 200℉ (93℃). This does not include any mixture having components with flash points of 200ºF (93.3ºC) or more with the total volume making up 99 percent or more of the total volume of the mixture. Examples include: aniline, benzaldehyde, butyl cellosolve, nitrobenzene and pine oil. Class IIIB combustibles are liquids with a flash point at or above 200℉ (93℃). Examples include: animal oils; ethylene glycol; glycerine; lubricating, quenching, and transformer oils; triethanolamine; benzyl alcohol; hydraulic fluids and vegetable oils. There are several things to consider when storing flammable and combustible liquids. In a single cabinet, a maximum of 120 gallons of Class I, Class II, and Class IIIA liquids can be stored. In a single fire area, there cannot be more than 3 cabinets. In any one group, the maximum number of cabinets can increase to 6 if stored in an Industrial Occupancy Facility equipped with an automatic sprinkler system meeting NFPA 13 standards. Securall Storage Cabinets provide several features to ensure safety. 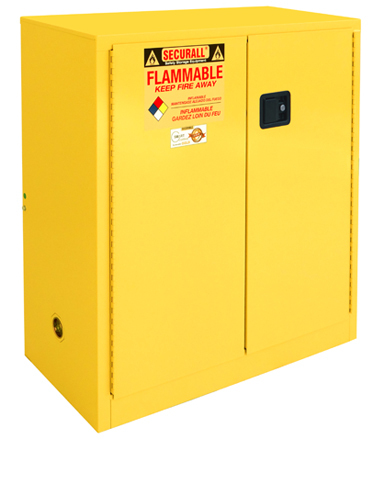 Flammable storage cabinets from Securall are OSHA approved and designed to meet NFPA Code 30 standards. Whether you need to store cans of gasoline or kerosene or are required to protect employees from the danger of explosion hazards, Securall has a large selection of models and sizes to store flammable cans (Models #A30, #A305, #A145, etc.) or drums (Models #V260, #V1110, #H160, etc. ).